Originally published under the title, "How to Minimize Annoying Warplane Attrition." The Turkish Air Force is retiring its fleet of RF-4E reconnaissance aircraft after two fatal crashes last month. What a coincidence! The mighty Turkish Air Force has decided to decommission its last batch of eight RF-4E reconnaissance aircraft shortly after two such aircraft and one F-4E crashed in a span of six days. Gen. Abidin Ünal, commander of the elite Combat Air Force unit, ruled out any technical failure for the serial crashes of Feb. 27 and March 5, but he mysteriously announced phasing out the aircraft because "this had been planned before." Gen. Ünal was right about the diagnosis: There was no technical failure in either crash. Two aircraft of the same model, featuring the same technical specifications, could not have crashed at the same moment due to the same technical failure. Apparently, all three mishaps were the result of piloting errors. Piloting error or technical, things are not going well in the Air Force. Between 1984 and 2006 1,500 military pilots resigned, seeking better-paid careers in civilian aviation. This columnist first mentioned "the alarming level of pilot retention in the Air Force which jeopardized operational capabilities" in an article in April 2006. Since then, hundreds of officers have been purged, detained or retired in what the ruling party belatedly admits was a conspiracy against military officers. 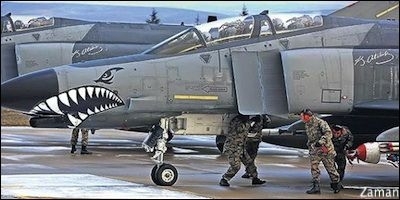 More than 800 military pilots have quit service since 2010. In addition, more than 800 military pilots have quit service since 2010 (of whom nearly 600 were combat pilots), further weakening the Air Force's overall training doctrine. The skies do not look bright for the Turkish Air Force. Gen. Ünal, who will probably take over as the Air Force commander this summer, and his colleagues at HQ must be pondering how to prevent crashes during training and other missions. No doubt, they are the professionals who should know how best to minimize attrition in their service. But a few modest suggestions from outside HQ should not hinder their work. This columnist suspects the real reason behind the mishaps might be lack of piety. Turkish fighter jets should be immediately equipped with stickers featuring the Ottoman Coat of Arms and prayer lines in Arabic script. They must also be outfitted with large evil eye beads to protect them from the enemy's evil looks and jealousy. The entire training concept should be revised. President Recep Tayyip Erdoğan recently expressed pride that the number of imam school students had reached 1 million. To compensate for the deserting Air Force pilots, war piloting must be introduced as a must course at the imam schools. Air Force commanders can comfortably tell every deserting pilot, "Go to hell!" if every year a few thousand imam-pilots joined the service. Naturally, a team of pious pilots would be less exposed to the risks of crashing. Symmetrically, at the Air Force academy for piloting, "The Life of Our Prophet" and Quranic teachings must be introduced as mandatory courses, along with classes on hadith, fiqh and classical Islamic science. Prayer beads should be made part of the pilot's standard flight equipment. Special software should be developed so as to lock ignition if a pilot does not read prayers before flight. Any pilot who does not pray five times a day or averts Friday prayers should be suspended due to the increased risks of crashing. Before every flight, Turkish jets should be sprinkled with holy water brought from Mecca. Promotions in the Air Force should win vetting from the Religious Affairs Directorate (Diyanet). True, the Diyanet's chief, Professor Mehmet Görmez, has a stronger personal interest in luxury cars than aircraft. But buying a private jet for him could lure him into the world of aviation and earn him expertise. To match his $400,000 Mercedes S500 official car, perhaps a nice, $81 million Airbus A319 ACJ would be the perfect choice. (Any jet more expensive than that would mean extravagance and therefore be un-Islamic). Of course, to further augment the structure, the Turkish Air Force could always borrow combat pilots from friendly, Muslim countries such as Syria, Egypt, Iraq, Iran, Saudi Arabia, Palestine and Libya.